What follows is the report based on the interrogation of Commissar-Major Rael Dracos, one of a handful of survivors of the ork conquest of Veris Island. IMPERIAL FORCES: Two squads PDF, one command squad, one las cannon, Sentinel, Chimera loaded with Tech Priest and five servitors. Lt. Sergio Calius in command; Commissar-Major Rael Dracos as attached observer. XENO FORCES: Two squads of Ork Boyz, one squad of Gretchins, one squad of Rockit-Boyz, and a Killa Kan.
Orcs advance on the Imperial line. The orks were cunning in their use of terrain. The Ork Boyz took a position on the flanks. To the Imperial left, one squad advanced and entered a forested area so they could approach under cover. On the Imperial right, a squad used a cornfield to cover their approach. The Killa Kan, with a small group of Rockit-Boyz, marched down the center–practically begging the attention of the Imperial firing line. The Gretchins attempted to flank around the left; the squad of Rockit-Boyz entered the cornfield in search of cover. The first squad of PDF set up a firing line on the left flank and waited; in the center, the second squad ran through the trees lining the central crop field, set up a firing line and targeted what they could. The Sentinel and Chimera targeted the Killa Kan.
As the Ork Boyz advanced in cover, the arrmored forces of both sides exchanged fire. Eventually, the Killa Kan was destroyed, allowing the fire to turn on the Gretchins and Rockit-Boyz. The Gretchins were knocked down in numbers by lasgun fire, but the destruction of the Killa Kan set off such a large explosion that the Gretchins and Rockit-Boyz took massive losses and fled. They were out of the battle. 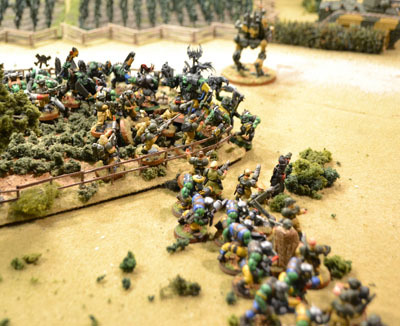 In an unorky strategy, the orks use a cornfield to shield their advance. As the Ork Boyz on the right flank began to clear the corn field, the Tech Priest ordered his Chimera to attempt to “tank shock” them. 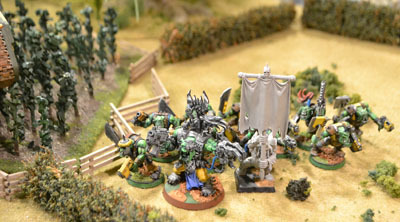 Although this was unsuccessful, it did force the orks to split their forces to avoid being run down. This was an attempt, the Tech Priest later explained, to push some orks farther away from the Imperial line. Thus if they charged, they might fall short of the PDF line. 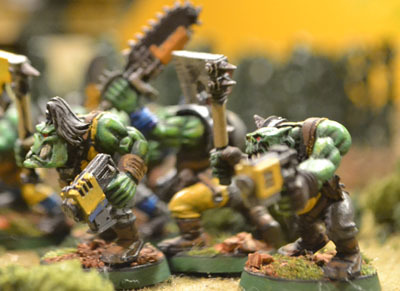 The maneuver did push half the Ork Boyz back about four inches, enough that it could have influenced the game. If the orks had fallen short, the servitors would have disembarked and added their fire into the rear of the charging ork line. But orks rolled extraordinarily well on their charge roll, and plowed into the Imperial line. On the opposing flank, the orks also made an astonishingly long charge. The Imperial line fire was adequate but not sufficient to stop the charge. And once it hit home, the loss of human life was immense, and the line collapsed. The ork and Imperial lines meet in vicious conflict. It at this moment the most controversial command decision was made. In our previous battle with the orks, Lt. Calius ordered his men to withdraw rather than maintain the firing line–and this almost brought disaster to the Imperial cause. When the lieutenant saw the carnage occurring, he attempted to order a retreat. To prevent that, Commissar-Major Rael Dracos executied him on the spot–and sought to strengthen the resolve of the men. Alas, the casualties grew so great that the line collapsed despite the fighting spirit of the officer. It cannot be overlooked that eventually the troops ran, but at least it wasn’t prompted by the cowardly order of an officer. The aftermath of the battle was difficult for the PDF. 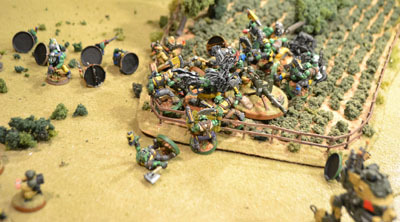 The Mechanicus Chimera provided cover fire for the retreat, but many infantrymen were chopped down by the advancing orks. Only a handful made it back to the coast to be evacuated. The island was completely occupied by the xenos. On the left, the Imperial line is gone. The few survivors are buried by the green horde. But there’s not use crying over spilt milk. War is full of mistakes, and in this case, the fortunes of war favored the xenos. Other than that, the players could find no fault with the tactics of either side, so it seemed fitting to let the victory stand uncontested. Veris Island had fallen. The orks were one step closer to conquering the moon of Hegira. The Corvus Cluster is a hobby blog that focuses on our wargaming adventures in the Warhammer 40K universe.